Front row, from left: Erin Swift ’22, Juliet Michaelson ’19, Emily Abbott ’21, Yasmeen El-Gerbi ’20, Antonella Davi ’19, Robert McLaughlin ’19, and Osborne Munyambu ’22; back row: Collin Porter ’20, Aidan McLaughlin ’21, Owen Mortner ’22, Joseph Diaz ’21, and Kate Jensen ’19. 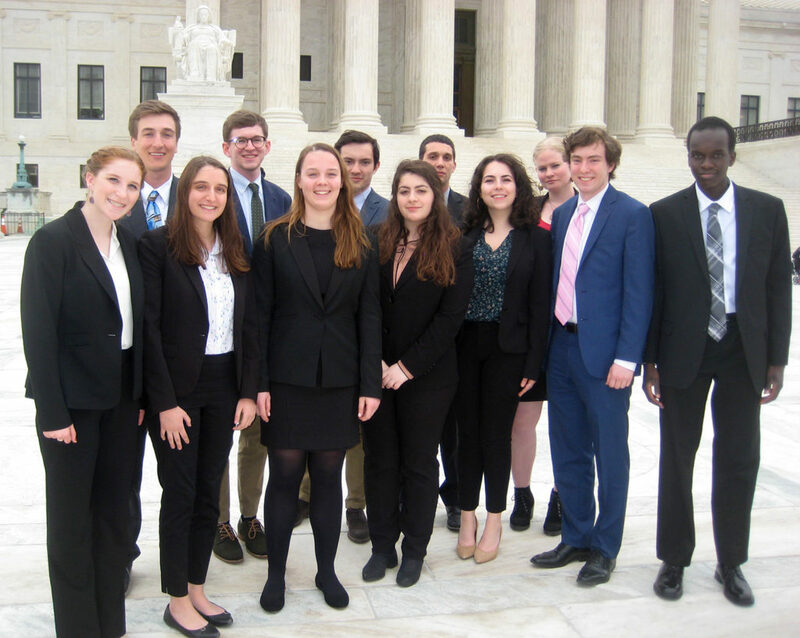 Mark C. Miller, professor of political science, and 12 Clark students attended oral arguments at the U.S. Supreme Court on March 25. Afterward, the students met with Supreme Court Judicial Fellows who are spending a year working at the Administrative Office of the Federal Courts, the Federal Judicial Center, and the U.S. Supreme Court. The students ended the day by meeting with Zak Doenmez ’14, who works for Senator Elizabeth Warren, and Ryan Early ’16, MPA ’18, who works for Congressman Jim McGovern. The night before, the group had dinner with a number of Clark alumni, an event sponsored by ClarkCONNECT. Joseph Jung ’20, who interned at the Supreme Court last fall, helped arrange the trip.